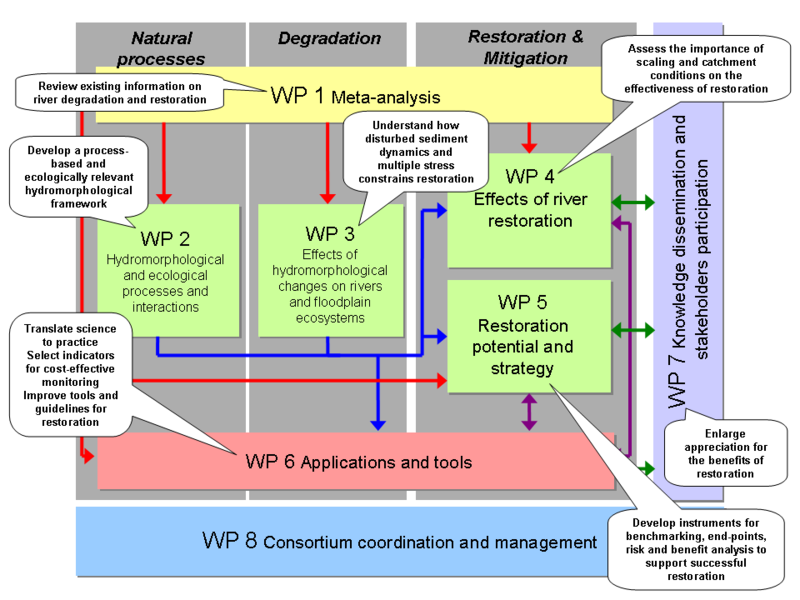 The overall aim of REFORM is to provide a framework for improving the success of hydromorphological restoration measures to reach, in a cost-effective manner, target ecological status or potential of rivers. Success is defined as being hydromorphologically sustainable, ecologically effective, and exploiting the full potential within the socio-economic setting. Cost-effective implies an optimisation of both ecosystem health and the goods and services that natural, modified and restored rivers, floodplains and connected groundwater provide. To achieve this aim the REFORM consortium will develop protocols and procedures to monitor the biological response to hymorphological change with greater precision, to support the design of programmes of restoration and mitigation measures for the WFD, in particular for the upcoming 2nd round of RMBPs, and to integrate restoration better with socio-economic activities. To select WFD compliant hydromorphological and biological indicators for cost effective monitoring that characterise the consequences of physical degradation and restoration in rivers and their services. To evaluate and improve practical tools and guidelines for the design restoration and mitigation measures. To review existing data and information on hydromorphological river degradation and restoration. To develop a process-based, multi-scaled hydromorphological framework on European rivers and floodplains and connected groundwaters. To understand how hydromorphological pressures interact with other pressures that may constrain successful restoration. To assess the significance of scaling effects on the effectiveness of different adaptation, mitigation and restoration measures to improve ecological status or potential of rivers, floodplains and connected groundwaters. To develop instruments to analyse risk and assess benefits of successful river restoration, including resilience to climate change and relations to other socioeconomic activities. To increase awareness and appreciation for the need, potential and benefits of river restoration.